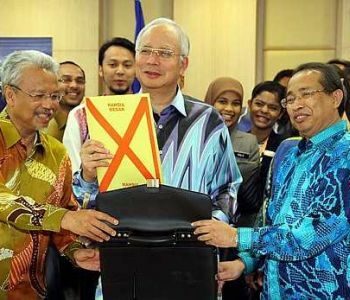 MAJOR railway industry players have dubbed Malaysia “the new rail industry hotspot” in light of the government’s transformation efforts to increase and enhance public transport, Prime Minister Datuk Seri Najib Razak said yesterday. “Just last week, the world’s biggest rail industry convention — Innotrans — was held in Berlin, Germany, and I have been informed that major rail players have described Malaysia as the new rail hotspot, growing far more robustly than any other country in Southeast Asia,” he said at a signing ceremony for a memorandum of agreement (MOA) between the Transport Ministry and China Southern Rail Zhuzhou Electric Locomotive Co Ltd (CSR) here. Najib said the contributing factors were the ongoing projects such as the Mass Rapid Transport (MRT), Light Rail Transit (LRT) extentions, new line plans, and the government’s study of possibly implementing High Speed Rail. “I believe this bodes well for Malaysia in terms of FDI potential and I hope more companies follow the example of CSR in making a long term commitment to the country,” he said. Najib anticipated a demand for 250 rail car and locomotive units in Malaysia alone in 10 years and the demand from Asean and the Middle East was expected to touch 2,900 units of new trains, generating a “massive market”.